I've said it before and I'll say it again... Bimmer is such a water baby! 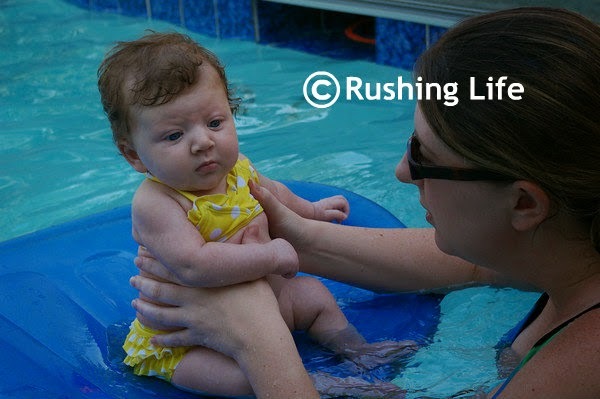 And July has also been the month that we started swim lessons! 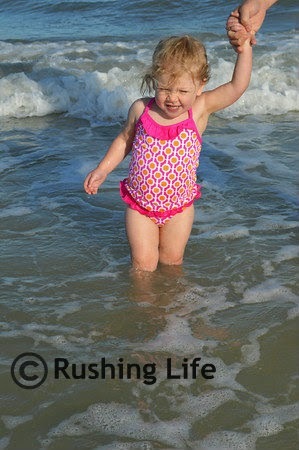 Yes, she is only two, and no, I didn't go into it thinking she would learn to swim independently. 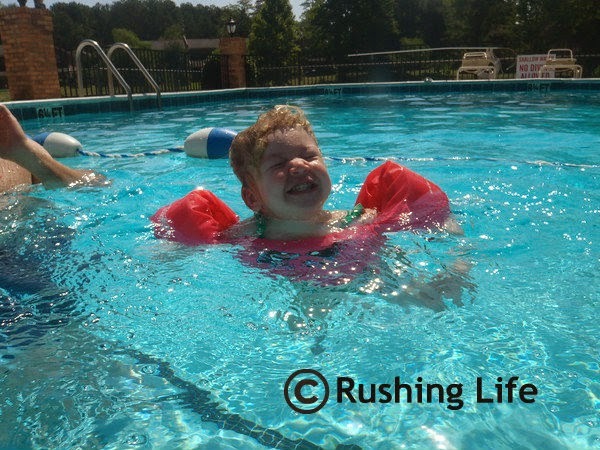 However, I knew that four Saturday mornings in the pool would be fun for her, if nothing else. The class is at the local YMCA and was for babies ages 6 months to 3 years old. I was definitely scared there would be kids in her class who hated the water and would disrupt the fun for Bimmer. I had no idea what to prepare for going in - other than I knew I would be in the water, and I wanted to make sure Bimmer had a blast. She did wonderfully! 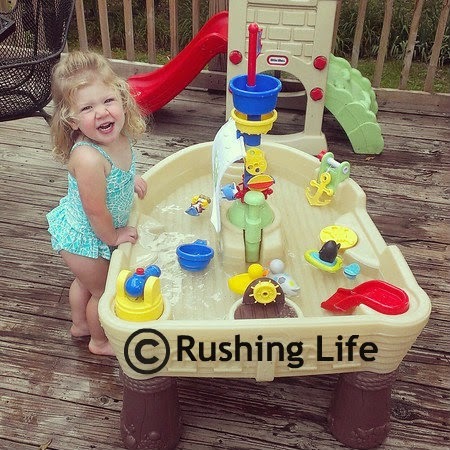 I wasn't sure how she would take to listening to instructions versus just splashing around, but she figured out after awhile that if she listened and showed the teacher, she would get to play with toys at the end. She blew bubbles, floated on her back, went under the water (which she asked to do again and again), kicked her legs (her favorite), threw toys and "swam" to get them to practice her arm strokes, and then jumped in to me (or, fell) several times at the end. 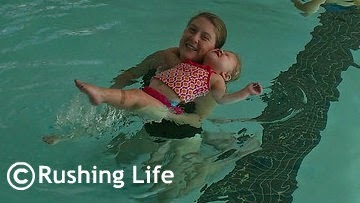 The instructor warned it would be repetitive, but that's what babies need, right? Puff had to go solo the second lesson. His assessment (not the teacher's) was that she is more advanced than the other kids, but needs to still work on her arms and feet. She is also the least afraid of the water. No surprise there! At the third (and most recent) lesson, both Puff and I tried to get into the water with her, but it was too overwhelming and she wasn't concentrating. So Puff jumped out. He'll hold the reigns next week. But the teacher told us that Bimmer is a good candidate for private lessons, because then she could start lessons before turning 3! I had never thought about that! 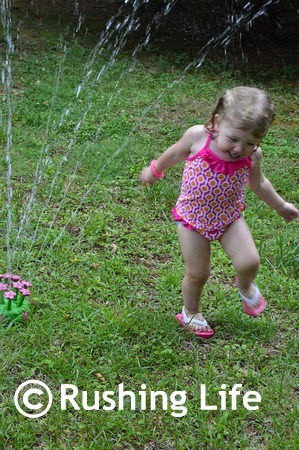 Summer in SC runs well into September, so I'm certain we will have plenty more opportunities for our little water girl to splash! And now Mommy and Daddy will be saving and eyeing a month in the spring to do some private swim lessons for our little fish!